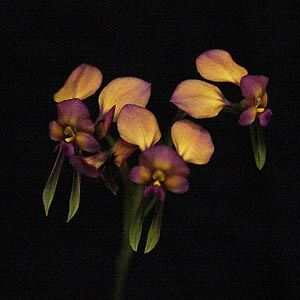 Although varied on color Diuris longifolia is one of the most attractive of all of the Donkey Orchids. Also known as the ‘Purple Pansy Orchid’, to our eyes this is one of the prettiest of the genus. Best described as a tuberous perennial, the green foliage will reach around 15 cm in height with the flower spike about the same. Flowers can be large for a small growing species, sometimes reaching nearly 5 cm. From the south west corner of Western Australia with good colonies around Perth, Albany and Margaret river this is one species that is not endangered. It is one of the first terrestrial orchids to be identified and named in Western Australia, being discovered in the late 1700s near the spot where Albany is now found. The flowers have the trademark ‘Donkey ears’ however it is the dusky purple variations on the petals that make this an outstanding species. The ‘Purple Pansy’ orchid, D. longifolia will flower in mid to late winter in its natural habitat. Again found in open forest areas in well drained soil that hold some moisture. This is not an easy orchid to grow, although it is common in in natural habitat. It is the combination of warmth, drainage and some moisture, along with low humidity that are the main requirements. Rarely offered for sale. If you are interested in these orchid species we suggest you contact the Western Australian Orchid Society or the Australian Native Orchid Society.